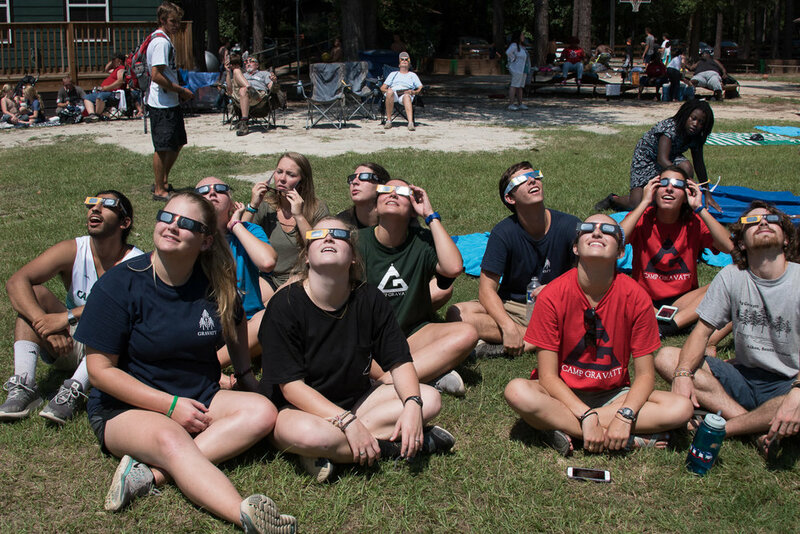 August 21, 2017, will long be remembered as a day of majesty, fellowship, food, and fun among the 917 people that gathered at Gravatt Camp and Conference Center, partnering with the USC Aiken Ruth Patrick Science Center, to witness the 2017 solar eclipse. With door prize raffles, swimming, zip-lining, canoeing, pony riding, and more, there was plenty to do as the crowds gathered, awaiting the main event: totality. For weeks, Gravatt staff worked tirelessly, preparing the grounds, fielding phone calls, and making reservations, all in preparation to welcome people from all walks of life to our ‘place in the woods!’ Program Director, Thomas Coleman, had this to say in response to the overwhelming success of the event, "I'm truly in awe of the support we received for this event. The outpouring of love and gratitude expressed by attendees as they were departing was incredible!” He went on to say that the event could not have been more awesome. The event was staffed with year-round employees as well as many former summer staff that traveled to help out for the day, in various capacities including life-guarding, running the zipline, and most importantly ensuring that each and every guest had the best experience at Gravatt possible! With two million anticipated visitors to the state of South Carolina, it was an honor to host nearly 1,000 at our very own Camp Gravatt for the “Total Eclipse of the Pines.” The staff of Camp Gravatt looks forward to welcoming many of these same visitors back through the gates for summer camp, corporate retreats, donor events, and so much more; after all, they are all part of the family now, and family is always welcomed back home!